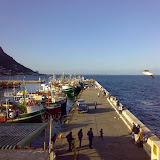 I quite enjoy a little outing to Kalk Bay now and then. One of the great things about living in Cape Town is that a 30 or 40 minute drive in any direction takes you to a whole new world. There are many nice restaurants in Kalk Bay, but we normally go to Polana so that we can relax in the lounge overlooking the sea (lots of whales these days). At the moment Polana is being renovated so we went upstairs, for the first time, to have lunch at the Harbour House restaurant. It really is a stunning venue to eat in, there is no denying that. There was a foreigner in our party and he was agreeing that to eat at a place like that in Europe would cost the same amount of Euros as Rands, in other words, it would cost 10 times more. The restaurant itself is light and summery. The light comes from the huge windows and glass sliding doors overlooking the sea. See the pictures in the gallery to understand what I am trying to describe. Half the restaurant is lounge and the other half is dining tables. This makes it a great place to relax with a drink and enjoy the view in summer and also in winter when they will have the centrally located fire burning. We took advantage of the dining room for lunch and then moved into the lounge for drinks. The menu is quite limited and definitely focuses on Seafood. We didn’t explore the starters or desserts much, one person had the prawn starter as a main in conjunction with the Beetroot and Butternut salad (R50). She enjoyed both tremendously. I was tempted by the tasty sounding Red Roman & Salsa Bruschetta but R75 for a starter is a bit extravagant for a simple computer geek like me. We all ended up ordering fish as a main. There was quite a selection of fish and one could have it in a variety of ways. I had the Cod with some potato bake, grilled veggies and a pesto cream. I enjoyed it, but it could have been warmer. One person had the Kingklip, 2 people had the Red Snapper and the rest had the Cod like I did. All the fish mains cost R120. There wasn’t much cheaper than that on the menu. So it’s quite a pricey place (as I had heard). I washed the lunch down with some Old Man’s Blend from Groote Post (R100). There wasn’t much cheaper than that on the wine list either. Two desserts were surreptitiously delivered to the table and consumed while I wasn’t paying attention. I assume they were enjoyable, they did sound appetizing. We spent a lovely hour relaxing in the lounge, enjoying the view. I took lots of photos which are in the gallery. We enjoyed the lunch and I would recommend the restaurant as long as you are not watching your pennies at the time. Had dinner with my wife at harbour house on friday, excellent food but SHOCKING service – the waitering team were all very slow and I had to tell the manager to call my waiter around 3 times…its not the waiters fault, it seems that they have just not been trained correctly…if a customer asks for something that urgent so they can enjoy their food ie salt/pepper dont only come back with it 5 minutes later when the food is cold! also dont try push your humour onto clients, when its forced it just comes out badly..
oh well – food and the view made up for the service, just a flag for them to sort it ou. Bad service can ruin a meal for me, not being able to get a waiter when you need one is high on my list of pet peeves. At a high end restaurant like Harbour House, this is unacceptable. I think we need to bring back the good old ‘walk out’ because I value my time and don’t see what gives restaurants the right to waste it. We enjoyed an excellent meal at the Harbour House a few weeks back. The service was brilliant – they were even nice about the fact we’d brought our own wine and paid corkage! The food was first rate and we had the best seat in the restaurant, just over the water. I couldn’t fault it – but it is expensive! Sadly the special hadn’t started yet. I’m hoping we can go back and enjoy their special that looks good value. Went to Harbour House with my girlfriend this evening. Was quite taken aback by the lack of variety on the menu as well as the prices that were being charged. In the end I settled for a calamari main course only to be dissapointed by the 8 or so pieces of calamari. I was shocked by what I considered to be very poor value for money and terrible service. I was also surprised by how rude the waiter was once he’d seen that I’d tipped him appropriately. He never said another word to us, just slapping pens on the table etc etc. I will never dream of going there again and will be sure to warn all my friends.